The practice was widely criticised for advancing too broad limits for extraterritorial jurisdiction thus possibly impairing foreign-policy interest of the US. It should be noted that the South African government initially opposed the apartheid lawsuit as allegedly interfering with the policy embodied by the Truth and Reconciliation Commission. This position was reversed in September 2009 when the South African government expressed its view that the US District Court for the Southern District of New York “was an appropriate forum to hear the remaining claims of aiding and abetting in violation of international law”. Despite a change of heart by the South African government, the apartheid lawsuit was still trapped into the ATS review process by the US courts, leading to a Supreme Court ruling in Kiobel v Royal Dutch Petroleum Co. on 17 April 2013. In this case, petitioners were Nigerian nationals who alleged that they, or their relatives, were killed, tortured, unlawfully detained, deprived of their property, and forced into exile by the Nigerian government. 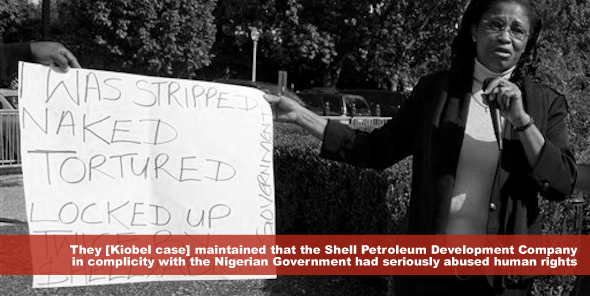 They maintained that the Shell Petroleum Development Company in complicity with the Nigerian Government had seriously abused human rights. One of the questions involved in this case was: “Whether and under what circumstances the ATS allows courts to recognize a cause of action for violations of the law of nations occurring within the territory of a sovereign other than the United States”, assuming that the “United States law governs domestically but does not rule the world”. This presumption against extraterritoriality serves to protect against unintended clashes between US laws and those of other nations which could result in international discord. The Supreme Court found the presumption against extraterritoriality applicable and maintained that: “[T]here is no clear indication of extraterritoriality here.” The majority concluded its opinion on an ambiguous note, suggesting a possible loophole to displace the presumption in respect of the ATS when “the claims touch and concern the territory of the United States […] with sufficient force”. However, it was stressed at the same time that “mere corporate presence” in the US does not suffice. The Kiobel decision influenced the plaintiffs in the apartheid lawsuit to adjust their arguments. They asserted in the first instance that the Kiobel presumption was distinguishable from their case due to American’s compelling support to end the struggle against apartheid in South Africa. However this adjustment was did not find favour with the Court. Quite to the opposite, the Court pronounced that “in all cases, […] the ATS does not permit claims based on illegal conduct that occurred entirely in the territory of another sovereign”. The Kiobel “touch and concern” test was, therefore, purely a territorial jurisdiction test, which appears as an opaque understanding of the majority judgement. Moreover the plaintiffs argued that the defendants had taken affirmative steps in the US to circumvent sanctions imposed upon South Africa, namely asserting that the American defendants continued to supply the South African government with their products, notwithstanding various legal trade restrictions imposed upon the regime in Pretoria. But again the plaintiffs’ attempts –to advance their suit as territorially linked with the US – failed. In this instance, the Kiobel majority pronouncement (“mere corporate presence as not sufficient to displace presumption against extraterritoriality”) clearly resonated against the plaintiffs advancing vicarious responsibility. Thus, as “the defendants’ putative agents did not commit any relevant conduct within the United States giving rise to a violation of customary international law”, the Court did not find the presumption against extraterritoriality convincing. Both Kiobel and the apartheid lawsuit outcomes seem to significantly bar effective application of the ATS as a tool to seek redress from international companies for their conduct undertaken in Africa. It is also doubtful whether a threat of ATS litigation will any longer compel corporations to conclude dispute settlements profitable for plaintiffs, like before. Marek Jan Wasinski holds a Master’s in Law degree (LLM) and a PhD from the University of Lodz, Poland. He is Assistant Professor and Chair of Public International Law and International Relations at the Faculty of Law and Administration, University of Lodz (Poland). He has published articles dealing with public international law and international human rights law. His research interests include transitional justice, the Rule of Law in the jurisprudence of international human rights courts and non-judicial controlling bodies, international protection of human rights. This is a very laudable and humanitarian effort to tame and/or eradicate impunity.